Bucharest, Romania, is on the verge of becoming the Bangalore of Eastern Europe because of the talent pool and low wages that the local market has to offer. Companies such as Oracle, Microsoft, Hewlett-Packard, and Accenture are investing millions of dollars in Bucharest by opening offices, hiring thousands of IT workers, and buying startups and their technologies. 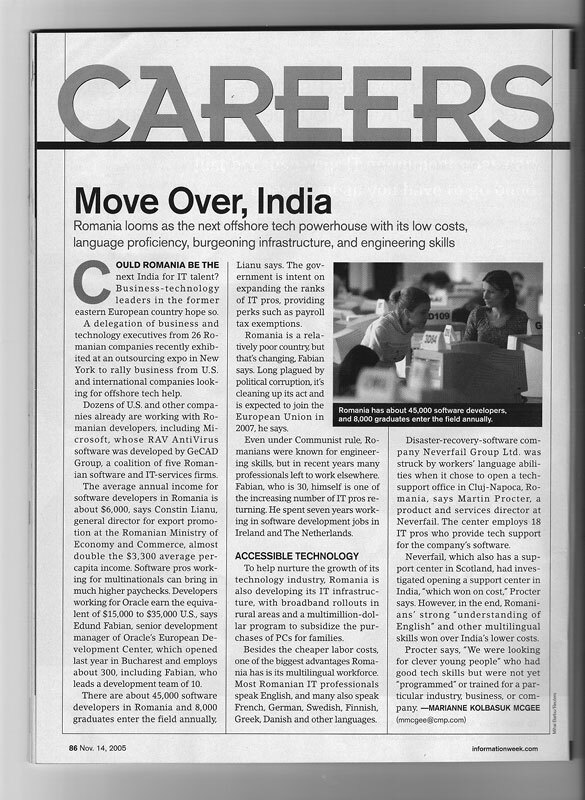 Romania is attractive because 60 percent of its workforce is believed to speak at least one foreign language, and because a programmer can be hired for about $500 a month, which is comparable to salaries in India and is 50 percent less than those in Poland and the Czech Republic. But what sets Romania apart is the excellent training and problem-solving skills of its computer specialists, who can handle more advanced research and development. Varujan V. Pambuccian, a computer scientist who is a member of Romania’s Parliament, says the country has about 16,000 software engineers, and about half focus on research and development rather than coding. Oracle will be increasing the number of people it employs for software development and product support in northern Bucharest to 1,000 in a few months, and the company also subsidizes IT courses at local universities. Such investment is even prompting Romanians who have left the country for employment abroad to return home.